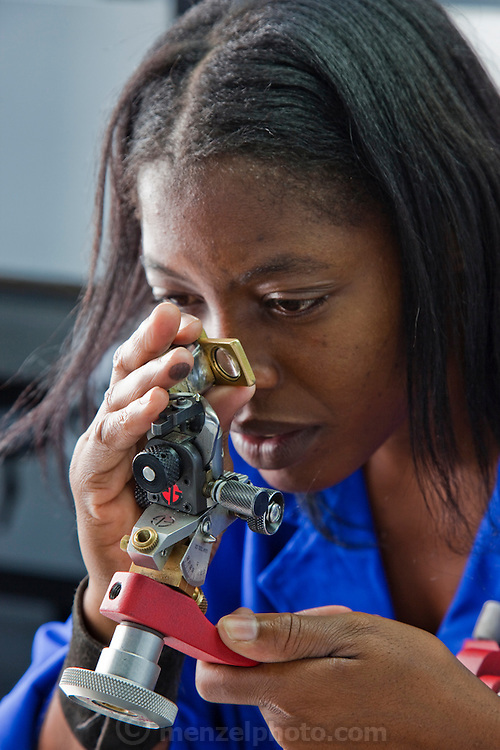 Mestilde Shigwedha, a diamond polisher, examines a gem as she prepares to polish it at NamCot Diamonds in Windhoek, Namibia. (Mestilde Shigwedha was featured in the book What I Eat: Around the World in 80 Diets.) Diamonds are one of Namibia's major exports, and while conflict diamonds grab the headlines, the fact is that the industry does provide a fairly decent living for many. "Mesti," as she is called, grew up in the north of Namibia near the Angola border in a mud and stick house that she helped cement with dung. She now rents a room in a house in Windhoek and supports family members and herself on her small income from Namcot. MODEL RELEASED.